Earlier today, we passed along the latest data from Strategy Analytics that showed Samsung shipping nearly twice as many smartphones as Apple did during the third quarter. It just so happens that IDC's numbers for the same quarter show basically the same results. According to IDC, Samsung was on top of the global smartphone industry with 84.5 million units shipped during the three month period. That was up 6.1% over the same quarter last year, and gave the company a leading 23.8% market share. IDC said that Samsung models priced under $200 had strong demand. Apple was second, with 48 million iPhones delivered according to IDC. That resulted in the tech titan posting a 22.2% year-over-year improvement, and was good enough for Apple to control 13.5% of the global smartphone market. The largest year-over-year gain was the 60.9% improvement in phone shipments scored by Huawei. The Chinese manufacturer had a 7.5% slice of the Q3 smartphone pie with 26.5 million phones shipped. 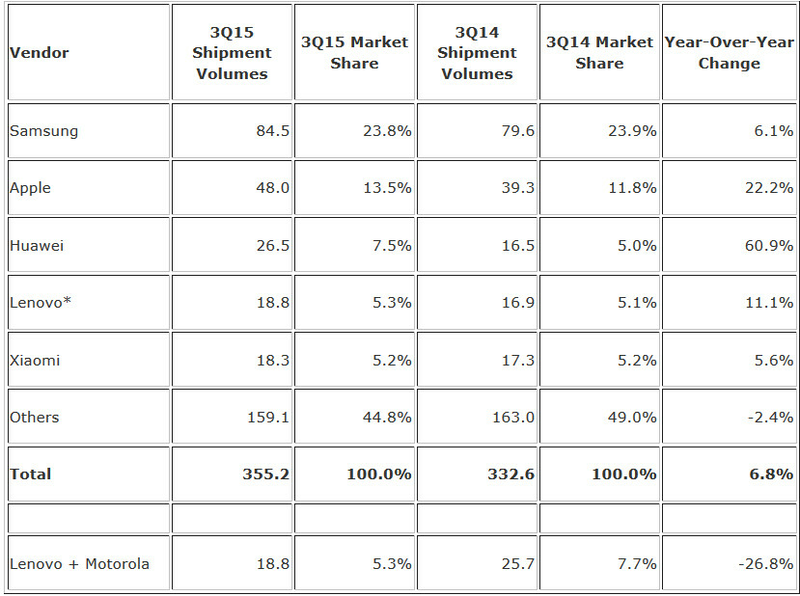 Lenovo was fourth with a market share of 5.3% after shipping 18.8 million units from July through September. That was up 11.1% year-over-year. Rounding out the top five was Xiaomi, with a 5.2% share. The company shipped 18.3 million handsets, good for a 5.6% year-over-year improvement. Overall, 355.2 million smartphones were shipped world-wide for the third quarter. That represented a 6.8% gain from 2014's third quarter total of 332.6 million units shipped. Good for them quite frankly, they've been working hard this past year putting out good, quality products. Hopefully their steak only continues with the Galaxy S7. They need to ramp up their low end portfolio if they want to keep people buying them. Stuff like the ACE 2x are garbage. They need to make their low end phones more like the Moto G. And ignore the SD400 and just go with leftover SD800 or SD801 like Oneplus is doing. Make less model of each segment & focus, provide software update for their older model. If Samsung wanted to copy Apple style don't just go for the cosmetic, instead copy their after-sales service. 2016 will be rough cuz they have to compete against chinese manufacturer. Bobbybuster is going to spewing that he missed this one. 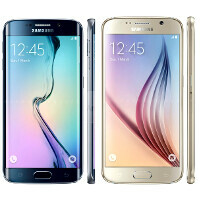 Samsung's AVERAGE selling price for phones was between $180 and $190 during the quarter (official numbers). iPhone's ASP was $670 (same quarter, again, official number). Samsung is just selling lots of cheap junk. You know in this world there are many people which do not afford to spend $600+ for a phone. But they want to enjoy playing with a smartphone. This is where Samsung step in. Do not be such an ignorant about human life condition on Earth. Forget about that Apple - Samsung battle. That's great of course, but comparing sales of different markets hardly makes sense (and Samsung's low end devices are pretty much terrible). Um, IOS and iphones are a different market. I am guessing it's okay to compare when Apple wins in a comparison but doesn't make sense when Apple loses in one? Yup, typical isheep stylez!!! The problem is that there are lots of $200 phones out there today that are just as good as the iPhone. And I'm typing on am $800 phone that's superior to it (the Note 5). Which 200$ or 500$ or even 10 thousand dollar phone got for example a ultra efficient- 3rd generation of custom 64-bit cores ? Or desktop class Flash storage solution ? Or supports 23 LTE bands ? Or some ultra sensitive display layer to measure pressure ? Well I don't know any. And the real problem is, that people don't know what they want as the choice of crap is immense. Well I know reading comprehension comes hard to Apple fans but he did say Note 5, which has a better screen, better camera, better build, better design, along with whatever you mentioned (including most of the force touch functionality). Plus, you can probably add the Nexus 6P to that list for your 500 range as well. How about better multi-core cpu that is 6 months old, better display, better audio, better camera, faster LTE, S-Pen, UFS 2.0 still have faster random write and random read, it has freaking stereo sound in videos lol, wireless charging, full NFC, bluetooth sending files lol, multi-tasking, QHD screen etc. Better antenna that picks up signals up to 3 times weaker while emitting up to 5 times less RF radiation (Note 5 vs iPhone 6S) while calling. More like Apple is just selling overpriced cheap junk. Everyone has different life strategies. Galaxy s6 edge+ for the win!